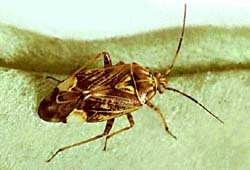 Lygus lineolaris occurs throughout North America. 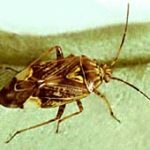 (The Tarnished Plant Bug in Europe is Lygus rugulipennis, this family of bugs often being known there as capsid bugs). Lygus lineolaris is around a quarter inch in length; the adult is often seen on or in daylily flowers and on leaves, frequently ducking underneath the bloom or leaf rapidly when approached. 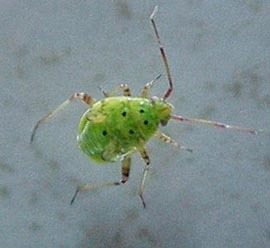 While the adult is usually yellowish brown with an obvious triangle shape on its back, the young nymphs are green and resemble aphids when small except that they move much more quickly. 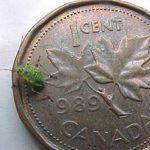 The adults overwinter under leaves and other garden debris, stones or bark. 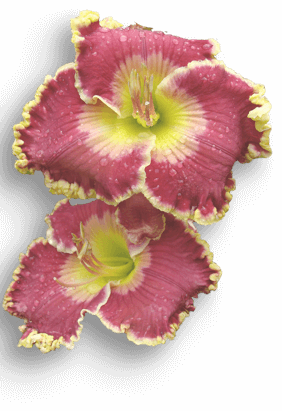 They emerge early in spring on warmer days and are active in the garden into the fall. Eggs are inserted into plant tissue. There are three to five generations a year, and in the south they may be active year round. 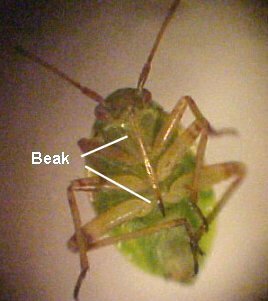 TPB’s are damaging to a wide range of plants including agricultural crops and vegetables as well as ornamentals; they feed by inserting a beak into the plant tissues, injecting a toxin, and sucking up the plant juices. 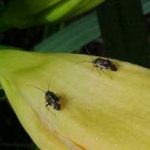 While the extent of the damage they do to daylilies is uncertain, in other plants their feeding can result in injury to flower buds, causing them to abort and drop, or the blooms not to open properly. Seed pods may be attacked, causing seeds to shrivel or be non-viable, and younger pods may drop. Feeding on other plant parts may result in distortion, stunting and dieback. The adults are highly mobile, which makes them difficult to control. TPB’s are particularly partial to alfalfa, and after this is cut for hay will often then move into neighboring gardens to find alternative food. They also tend to be more of a problem in dry years. Clean up leaves and other garden debris in the fall to remove overwintering places. Control weeds which can provide food and hiding places. If necessary, spray with insecticidal soap early in the morning when the bugs are still sluggish from the cooler temperatures. The image was taken by Ralph Underwood. Permission granted by Agriculture and Agri-Food Canada. Any additional uses of this image must be received from the copyright holder directly – AHS does not have permission to grant additional usage of this image for any purposes. 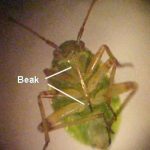 This image show above show the feeding “beak” that is inserted into plant tissue to feed. An older nymph. Note green color and how different it looks from the adults. 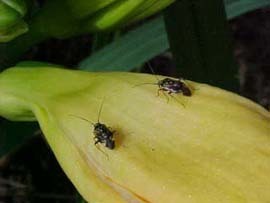 Younger nymphs are smaller and resemble aphids but are faster moving. 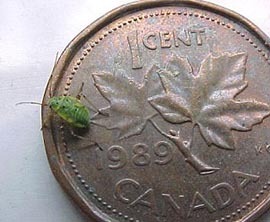 Showing the comparative size of the older nymph on a one cent coin (U.S. and Canadian pennies are about the same size).